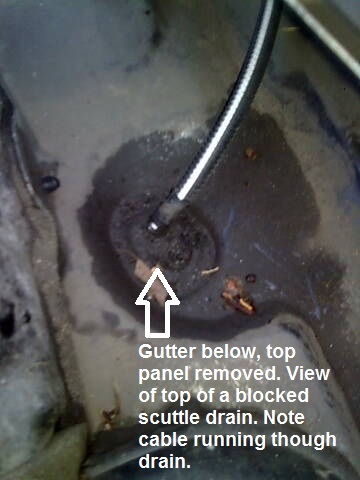 What is a scuttle drain? 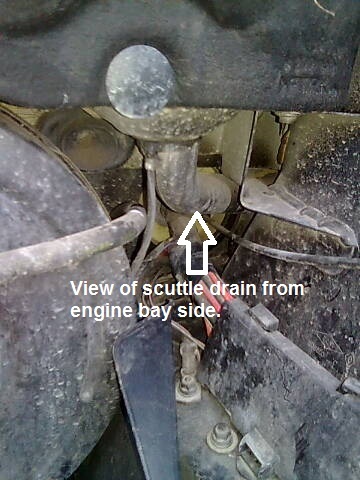 A scuttle drain is used to divert any water which falls on your car windscreen to the ground, without coming into contact with your engine or exposed metal. When water falls onto a car windscreen it runs down the face of the glass and is diverted though drainage holes onto a covered collector gutter below. 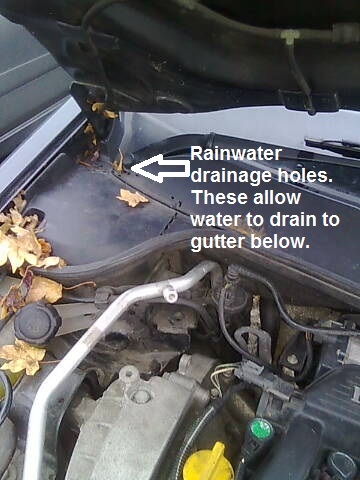 The water drains through holes on either side of this gutter and is then diverted through rubber scuttle drainage pipes which direct the water onto the ground below the car without any splashing onto engine parts, metal or wires. There are usually two, on either side of the car. How do they get blocked? The dirt and leaves that fall onto the windscreen can block the drains. Like most people I had never cleaned mine and it took a few years for them to become blocked. If the car is parked under trees I would imagine it would be more likely that these drains would block. How can they be cleaned? The drains are located in a difficult to access area at the back of the engine. The plastic panel at the base of the windscreen usually has to be removed to access the top of the drains. The drains can then be cleaned out using a flexible wire and flushed with warm water. Personally however I would ask your mechanic to do it during the next service. As a precaution the car user should remove any visible leaves and dirt on a daily basis from the base of the windscreen before it is washed into the gutter below. Thanks for the info. My problem is water collection in the trunk of my BMW hardtop convertible. Any idea about where to get a schematic of the drain system on various cars? G,day and thanks for the input! I have this ongoing problem. I have replaced the pollen filter and put scuttle panel back. I am still getting water in. Exactly, where are the drain holes, there are about six on each side. Which one am I looking to clear? The picture showing the cable, is that the hood release cable, just so I can work out the vicinity of where to start. My original problem was in fact, the heater core, which cost $4000 as they have to pull the entire dash out. That,s fine but this other is driving me crazy! A closer picture would help! Thanks!! it’s a Bmw, that’s why. 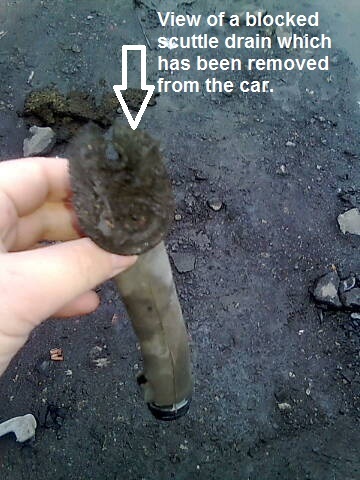 thnks – I have 2006 c280 and it fills with water when it rains heavy – I checked drains on windshield and found 1 clogged but yet to remove battery to check that drain – thanks for info..
Any ideas on how much it will cost to get a garage to clear out the scuttle drains? I’d do it myself but it needs to be done asap, I don’t have access to any overhead cover, and it’s set to rain for the whole week (like literally non-stop rain). Thanks. I dunno if conversion works but my friend who had this problem few weeks back (that led me to self check my own car gutter system) paid only about $16 or $20 (converted from local currency) for a home service from car brand distributor service. (Mine is a Toyota) I understand he made a prior booking. Am trying to do the job today that lead me to this site, with few tools on my hand I guess i have to make a call asap.